The population of London is steadily increasing putting a higher demand on the public transport. Crossrail was a solution adopted to renovate the current rail network providing a faster more reliable service. Farringdon Station augerboring was a vital component to the overall scheme. The Crossrail Project had reached a stage were cross passages need to be installed allowing services to run between & out of the main tunnel network. A 300mm pipeline was required from the Western Ticket Hall of Farringdon station to the Eastern running tunnel. The install was small diameter, but at 30 metres deep in the main shaft, the ground conditions were extremely hard with high ‘N’ values, thus rendering standard augerboring ineffective. Further, the proposed trenchless installation was on the critical path of the main programme. The Farringdon Station site C435 was located off Farringdon Road in Central London which presented a challenge in terms of access & scheduling deliveries. 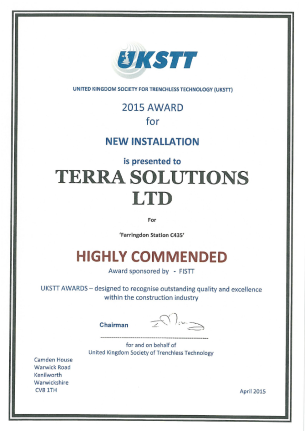 Early involvement from Terra Solutions trenchless contractors ensured no negative impact on other vital work elements. After a site meeting & reviewing the contract documents it was clear that a standard augerboring solution was not feasible, the high ‘N’ values in the Upnor Formation meant that it was suitable ground conditions for the Frontsteer Augerboring Rig. The system (a hybrid between TBM and GAB) is advantageous due to its capabilities in stiff ground, small footprint & low running costs. Stringent site protocols required meticulous logistical planning to ensure there were no hold ups on site. 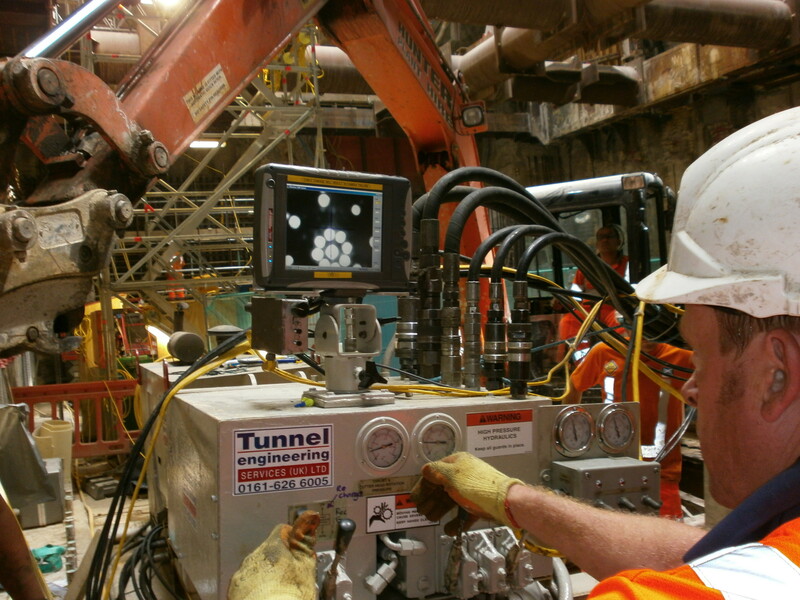 Once the machinery was mobilised & set up Terra Solutions installed 37m of 300mmø of Naylor Denlock pipe. 24hour working was adopted using two squads consisting of four men each working alternative 12 hour shifts to complete the installation in the short window available. When the pipe was installed it was pressure tested to ensure quality standards were maintained & the pipe was fit for purpose. This difficult installation in flint-laden Lower Lambeth Clays (Upnor) was completed in accordance with the Main Contractors programme. Another challenging on-time and to budget project completed by trenchless specialists, Terra Solutions Limited, for a major infrastructure project. The technical challenges of this installation was recognised by the United Kingdom Society for Trenchless Technology (UKSTT) with a 2015 Highly Recommended New Installation award for the project. This award is designed to recognise outstanding quality and excellence within the construction industry.